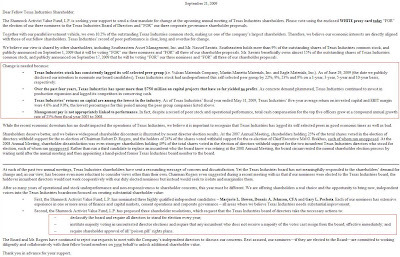 At each of the past two annual meetings, Texas Industries shareholders have sent a resounding message of concern and dissatisfaction. Yet the Texas Industries board has not meaningfully responded to the shareholders’ demand for change and, in our view, has become even more reluctant to consider views other than their own. Chairman Rogers even suggested during a recent meeting with us that if our nominees were elected to the Texas Industries board, the holdover incumbent directors would not work cooperatively with our duly elected nominees but instead would seek to isolate and marginalize them. –require shareholder approval of all “poison pill” rights plans. ...but that doesn't mean shareholders don't deserve a right to elect new directors if they desire a change at the top. Yay, capitalism! How does this work out? Save your soul for 60 times the market price! Option mortgages "set to explode"
Ken Fisher says we're UNDER-leveraged.